Sygic keeps tracking your recent destinations, making it easy to return to a place that you have been navigated to before. When entering an address through Menu > Navigate to…> Address or POI , the last address entered is preselected. When selecting a City or a Street, the list of previous selections will appear. You can also go directly to a list of recent destinations by selecting Menu >Navigate to…> History and start navigation by selecting a previous destination from the list shown. Tap Drive to, Walk there or Traviel via to navigate to a chosen recent place. 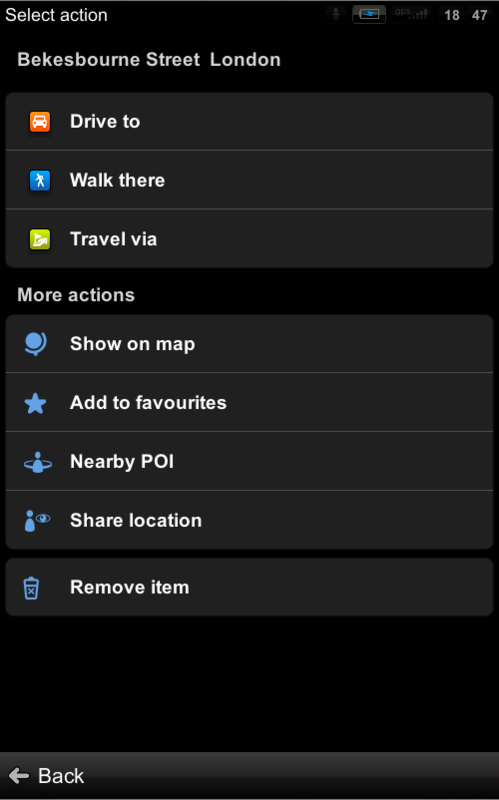 Tap Remove item to delete the place from the list of recent destinations.